For a few years, my late brother and I had talked about getting another dog. We had grown up with dogs in our home and we had a void we wanted to fill. Unfortunately it never happened when he was alive. Then, one day at work I was skimming through the classifieds in the local paper and came across an ad for a Brittany Spaniel. I decided to call. The price for the dog was far more than I would pay. After all, I really wanted a dog that would be a good companion for me and my 80-something father. Oh, and it has to like water. After all, I live in Michigan and on the water. 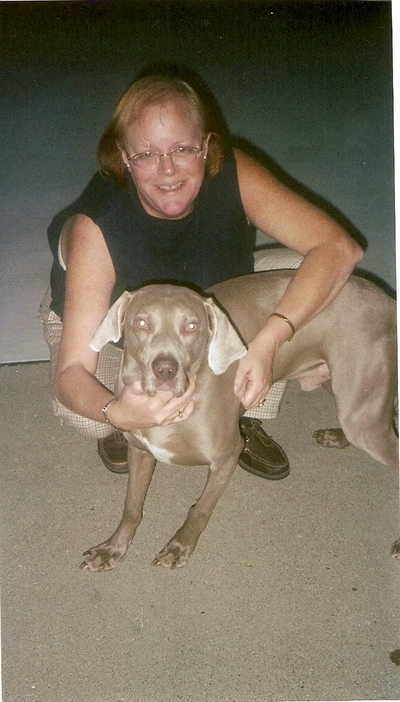 That’s when the kennel owner said he had a 3-year-old Weimaraner that they had rescued. He said he is a good dog and wanted to find him a good home. A couple days later, my dad and I made the hour-long drive to meet the dog. Within two seconds, he approached me, rolled over on his back and exposed his belly. One belly rub and I was his! Besides, with a middle name like Blue, how could he not be destined for a Wolverine home? Stanley quickly adapted to his new home, acting like he had been there since he was a pup. No matter where we go, he attracts people and makes new friends. He loves to travel and has made two trips to Mackinac Island in northern Michigan, which requires a ferry ride and not in a car, because cars are banned on the island. When my father was in the hospital, Stanley got permission to visit. He also visited him regularly in rehab and the nursing home. Of course, he had to make his rounds and see everyone! We lost my father a l ittle more than 2 years ago and there are days when Stanley goes and lays on his bed. I think he feels close to him. Getting Stanley was the best decision I have made in a long time. He had a rough start in the beginning of his life, but things are better now and he has a home overflowing with love. My friends will tell you there is truly little doubt that he is my boy.